Game One: Team A vs Team B. Game Two: Team C vs Team D.
Winners’ Match (WM): Both winners from game one and two confront each other. Winner will go to the upper bracket in the Main Event. Elimination Match (EM): Both losers from Game One and Game Two confront each other. Loser will go to lower bracket. Decider Match: Loser of WM versus winner of EM. Winner will go to upper bracket and loser will drop to lower bracket. For this tournament, 8 teams were directly invited and 8 qualified to win a spot. There are a lot of matches that we are expecting and that promise to be really exciting. For example, we’ll see the big Chinese teams compete with the lineups from the rest of the world. We still don’t know what to expect from these matchups, as the new formed rosters need to prove a lot against lineups from different regions. We will see which region ends up dominating; there’s not much we can predict, as each region comes with amazing teams. Standings and results of the group stage get updated live. Betting odds for day one and two will be available in short time. 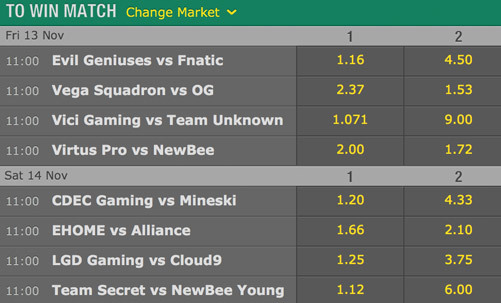 Most likely all major esports betting bookmaker will have match bets soon. In the meantime take a look at the current tournament win bets or at more general information about DotA 2 betting. This first match is interesting because of two things: Newbee hasn’t played against any Western team for a long of time. However, they have been doing very well in China. On the other hand, Virtus Pro has done poorly in Europe, but has done very well against Chinese teams. Newbee will have to prove strong against this anti-Chinese lineup. Fighting against Virtus Pro can be overwhelming for a lineup that hasn’t confronted the aggressive Russian playstyle in a while. Vega was an outstanding surprise in ESL One NY 2015. They started beating the TI5 champions in a perfect match. Then, they scaled up to winning the tournament against the top teams in the world. This was very impressive and it showed the potential behind this long-lasting lineup. However, it might be that other teams figured them out, as they haven’t been performing that well against weaker teams. OG, on the other hand, is one of the most consistent new lineups. They’ve showed a really strong game in all lanes from the beginning. To win this, Vega will have to surprise us once again. This is not unlikely, as the ESL champions have showed how good they can be. EHOME is right now the top 2 Chinese team. This new lineup is doing great under LaNm’s command. They’ve only had a hard time against Vici Gaming, their national counterparts. On the other hand, Alliance has been all about downfalls and comebacks. They barely made it into the Major, but they delivered two of the most amazing Dota 2 comebacks that have ever existed. They surely have a high morale right now, and let’s not forget they are former TI champions. EHOME will have to show they are ready to go against the Western-rat style Alliance is so famous for. This match presents two young teams that came to the pro scene not so long ago. CDEC has the advantage here since they never fell from the Winners Bracket in TI5. Mineski have only proved to beat Fnatic in SEA, a team that was supposed to dominate that region. CDEC, as a young team, is struggling since the rest of the pro teams have studied them. Mineski might be able to win against their tempo-based style. If Mineski manages to control CDEC’s fast game pace, they can end up victorious. However, CDEC has already much more experience than Mineski, so they have the upper hand here.